We are moving through the final stages of the Lenten season, and this upcoming “Palm Sunday” is what if often thought of as the beginning of Holy Week. Palm Sunday represents the triumphal entry of Jesus into Jerusalem, and it’s the clearest declaration there is of Jesus’ pronouncement as Christ the Messiah. Much can be said about the this account, but for this post I want to focus just on the revelation piece. Though his entrance was choreographed to send a message to everyone, Jesus was particularly interested in confirming the revelation to the Jewish spectators. There was a lot happening in this account, and it’s been helpful for my own understanding to get a better sense of what Jesus was walking into and what the symbolism of all these different elements pointed to. It was into this convergence – interest in the Messiah, and interest in Jesus – that the triumphal entrance into Jerusalem was choreographed. For Jesus, the time had finally come to unequivocally announce himself as the Messiah. And each detail was significant. According to Matthew, Jesus and his disciples prepare to leave Jericho and head into Jerusalem (interesting side note – the road into Jesus’ final passover went through the exact same terrain as described in the parable of the Good Samaritan), and we see that very specific instructions are put in place. What’s so interesting is the way that these directly align with the ancient prophecies. Zechariah in particular described the future entrance of the Messiah, and watch how closely the actual events match. 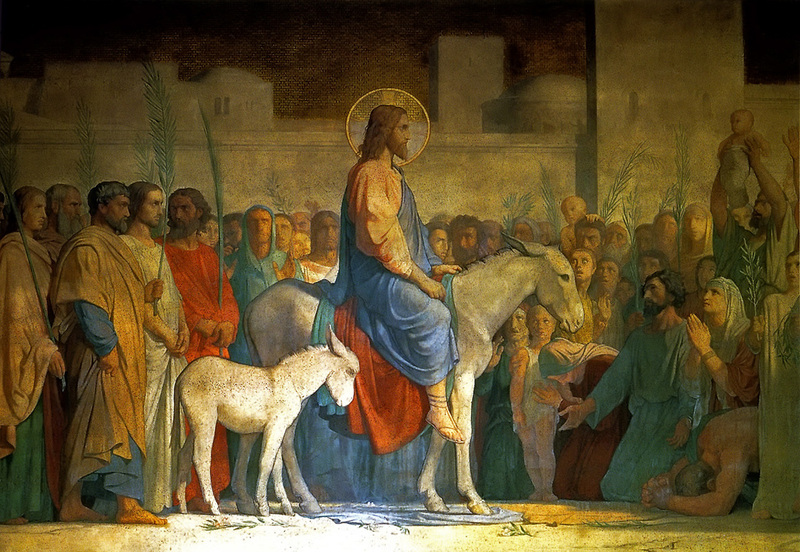 Undoubtedly many things, but here is what I am reflecting on this particular Palm Sunday: When Jesus choreographed his entrance into Jerusalem, he wanted to ensure that nobody was unclear about his own sense of self-revelation. Jesus was the Christ. The Messiah. The King of Kings. The Son of God. God himself. Jesus the Christ had come to give himself as a ransom for many. He had come not to be served, but to serve. He had come to pay an incredible price so that we could be set free. He had come as the full embodiment of love. As this Lenten season winds to a conclusion, those are all things I want to remember and revel in. And I pray the same will be true of you too. Thanks for the reflections. Did you intentionally invert Jesus’ saying from Mark 10:45 that the Son of Man came “not to be served but to serve,” to he came “not to serve, but to be served?” If so, i missed the point or the application. What is a layperson/non-Bible scholar to do?? Here is our dilemma: Every Christian Old Testament Bible scholar, apologist, pastor, and priest on the planet says that the Old Testament prophesies the birth and death of Jesus of Nazareth as the Jewish Messiah (ben David). However, every (non-messianic) Jewish “Old Testament” scholar and rabbi adamantly states that there is not one single prophecy in the Hebrew Bible about Jesus. So who are we poor ignorant saps to believe? 1.) Jewish sages and rabbis who have spent their entire lives immersed in Jewish culture, the Jewish Faith, the Hebrew language, and the Hebrew Bible—for the last 2,000 years…or… 2.) seminary graduates from Christian Bible colleges in Dallas, Texas and Lynchburg, Virginia? Sorry, Christian scholars, but using good ol’ common sense, I have to go with the Jewish scholars. And Jewish scholars say that Christian translators deliberately mistranslated and distorted the Hebrew Bible to say things in the Christian Bible that is never said in the original Hebrew—for the purpose of inventing prophesies into which they could “shoehorn” Jesus! Helpful info. Fortunate me I discovered your web site accidentally, and I am surprised why this twist of fate did not took place earlier! I bookmarked it.